The Mohegan Sun traveller’s destination situated in Connecticut. Offering the travellers loads of options to delve in, the Mohegan Sun is amongst the top of the tops. Besides providing luxury hotel accommodations, fine dining opportunities, retail shopping, happening casino life, Kids Quest entertainment facility and a convention centre, Mohegan Sun is also THE place to visit for live sporting and entertainment events. These sports and entertainment events take place at the popular Mohegan Sun Arena, one of the top arenas of the world. Ranked in the top 6 of “Top Stops of The Decade” recently and number 4 last year by Venues Today, the Mohegan Sun Arena provides full throttle entertainment to all the visitors all year round. The Mohegan Sun Arena has also had the privilege of being ranked by Billboard Magazine as 3rd in the top entertainment places to visit in the US and 4th best in the whole world. So when there is a line-up of events at the Mohegan Sun Arena, entertainment lovers make it a point not to miss them. 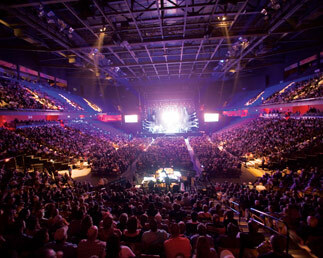 The Mohegan Sun Arena is built to a capacity that can easily seat 10,000 spectators at one time. The exhibition space alone in the arena is built over an expansive area of 30,000 square feet. It is a multipurpose arena that not only features major sporting events of the years, but some of the top concerts are also lined up here. Entertainers like Billy Joel, Britney Spears, Kenny Chesney, Fleetwood Mac, Chris Tucker, Meat Loaf and Frankie Valli & The Four Seasons are some of the frequent performers at this arena. Besides top concerts, the arena is also famous for many sporting events. The spectators get a chance to see Mohegan Sun’s own “The Connecticut Sun.” Besides this WNBA team, the audience will also be able to attend championship of boxing, professional basketball tournaments and WWE. Strongman Grand Prix events are also hosted at this arena since 2005. The seating arrangement of the arena is adjusted each time for separate event. In fact for different sports there are 5 varying configurations to which the seats are configured. Similarly for concerts, the whole seating area of the arena is configured again. Like every year, there are many events that have been lined up for the remainder of this year at Mohegan Sun Arena. Mohegan Sun has ample opportunities for visitors travelling from afar. If you decide to travel to this destination for your holidays be sure to check which concert or which sporting event is playing during those days.